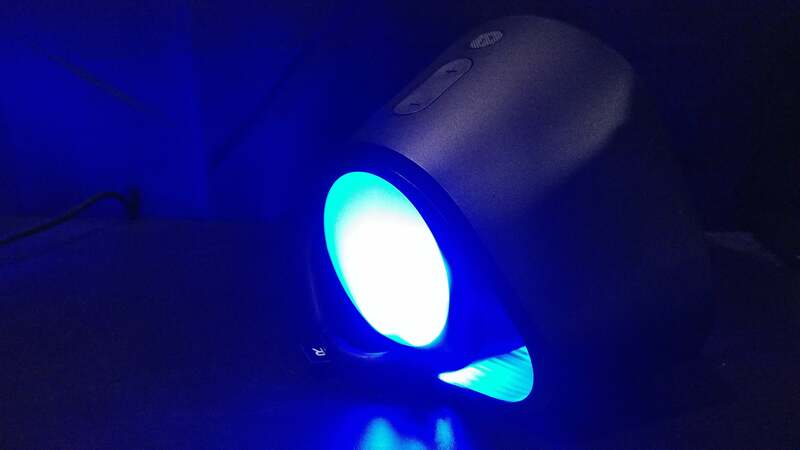 RGB is the buzzword in peripherals these days, but few have found any real use for them. It’s all well and good to have an RGB-enabled mouse or headset or keyboard, but aside from a few gimmicks like “imitating the sirens in Grand Theft Auto,” it’s still more about aesthetics than functionality. Logitech’s G560 changes that, using RGB LEDs in a way that feels transformative. If only the effect were paired with slightly better speakers. Way back in 2013 Microsoft showed off footage of a prototype for the Xbox One, the “IllumiRoom.” Emerging from Microsoft Research, IllumiRoom promised to make gaming more immersive by literally immersing you in it. Using a projector synced to your actual TV, the goal was to extend the picture off the screen and onto the surrounding walls. This projected section would look worse than the actual TV picture, rendered at lower quality to keep the frame rate impact minimal. But it wouldn’t matter much—your peripheral vision isn’t very sensitive to detail anyway. You’d feel as if the picture were much larger, wrapping around you. It was a cool idea that went nowhere. Maybe it cost too much, or maybe the hit to performance wasn’t worth it—especially on the already-struggling Xbox One. But for years now I’ve waited for someone to take up the baton. The G560 isn’t IllumiRoom, but it’s close. 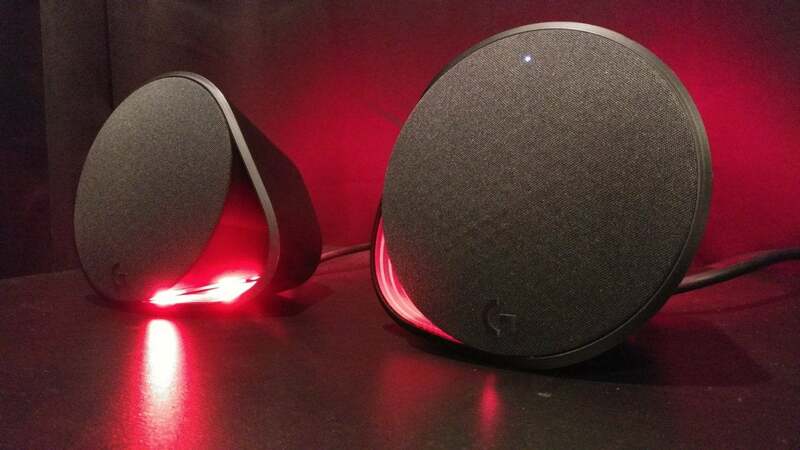 A 2.1 system, the G560 consists of two rounded satellite speakers and a large, vertically-oriented subwoofer. It’s not as eye-catching perhaps as Harman Kardon’s famed SoundSticks, but it’s still a pretty attractive set even with the lights dimmed. The G560’s RGB lighting is key, though. Plug it in, and both the front and rear of each speaker illuminate. The front zone wraps around a cutout next to the speaker, while the rear is a larger and brighter light meant to diffuse across the wall behind your desk. Arrayed properly, the G560 ends up acting a lot like those ambient backlighting kits you can buy and stick to the back of your monitor. The default is an orange/blue color gradient seen in most of the G560’s marketing. You may, of course, key in the usual lighting effects—static, wave, rainbow, et cetera. 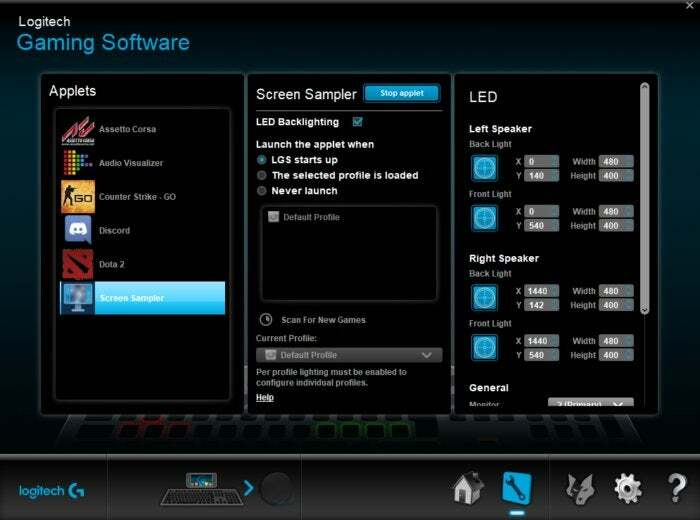 But Logitech’s real coup is a screen sampler. I’ve complained about RGB lighting for years, or rather the fractured nature of RGB lighting. Logitech has its SDK, Razer has another, SteelSeries has a third, and so on. It practically ensures your RGB peripherals will stay a novelty, because few game developers are going to bother implementing all these disparate versions of the same idea. It’s why we see companies competing for exclusives, like Razer with Overwatch or Logitech with Grand Theft Auto V.
With the screen sampler, Logitech essentially bypasses this constraint. Sure, you can still get better results by programming specifically for the G560’s unique feature set—but you can get perfectly passable results with no effort on the developer’s part. By default, the screen sampler keeps tabs on the four corners of your screen. The bottom-left corner corresponds to the front-left lighting zone, top-left to the back-left, and so on. It then averages all pixel values in that area to determine what lighting to use, moment-to-moment. Let’s say there’s a nighttime scene with a fire pit in the bottom-left corner. In that scenario, the front-left lighting zone on the G560 might glow orange, while the other three show a deep blue. The effect updates constantly, so if the camera panned across the scene you might see the left zone eventually turn blue and the right turn orange, in line with the fire. It’s not IllumiRoom. It’s nowhere near as advanced, nor is the effect as all-encompassing. But it’s amazing how much the effect adds to the experience, especially at night. If I turn the speakers off I immediately notice the image on-screen feels smaller and more constrained. I’ve even left the G560s plugged in and running while using a headset or another pair of speakers, because once I tested the lighting effect I never wanted to go back. It really is the first time I can say that about an RGB peripheral. Logitech and its peers have always talked about keyboard lighting contributing to immersion, stuff like that—but I’m rarely if ever looking at my keyboard while gaming, and the backlighting isn’t nearly bright enough to signal anything. The G560 is right in my line of sight, and the screen sampler is intelligent enough that it’s contributed to really eerie moments in Shadow of the Tomb Raider, Destiny 2, and a few other games this year with intense and purposeful lighting. Unfortunately that lighting effect will run you quite a bit of money, relative to the sound quality. These are $200 speakers, which isn’t much if you compare them to a high-end 2.1 system, but it’s a lot compared to your standard PC speakers. For that money you can get some solid-sounding setups, including Logitech’s own Z623, the Klipsch ProMedia 2.1, and the aforementioned Harman Kardon SoundSticks. The G560 isn’t bad, but it doesn’t surpass these other (often cheaper) options, at least to my ears. Part of the problem is a wonky volume scaling algorithm that still hasn’t been fixed. Starting at “0,” or muted, the G560’s volume steps basically go: Quietest (2), Quieter (4), Quiet (6), Loud (8), Louder (10), and Deafening (12 – 100). The scaling is all wrong too, with exponential jumps between 4/6 and 8/10, meaning 8 is almost always too quiet for what I’m trying to do and 10 way too loud. I’ve held off reviewing the G560 for a few months, in part because Logitech told me this volume scaling issue would be solved by a firmware update over the summer. In my experience, it hasn’t. There was a firmware update as promised, but the G560 still gets way too loud too early, making nearly 90 percent of its volume settings unusable. There’s a workaround. You can go into Logitech’s software and drop every single EQ setting by about 20 decibels, giving you more headroom to adjust volume. That hassle shouldn’t be on the end-user though, and indeed the Internet is rife with complaints about the G560 being “too loud.” Not a complaint I’m accustomed to seeing with PC speakers, but it’s appropriate here. The problem goes beyond your poor, deafened ears. At low volumes the G560 system sounds significantly worse than it really is. It’s completely dominated by bass, the subwoofer coming through way more than the two satellite speakers. 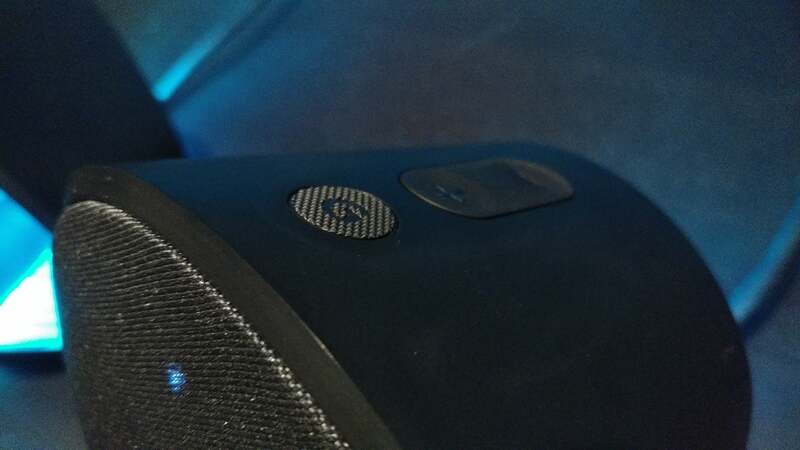 Again, you could go into Logitech’s software and adjust the bass manually—but when you turn the volume up, you’ll then have an anemic, shrill sound. The solution is just...never turn the speakers down that far. Anyway, at an optimal volume—I guess “8” or “10” because anything else is too loud—the G560 sounds pretty decent. The subwoofer is powerful, even shaking my desk on occasion. If you like a beefy bass sound, this is a solid choice. The satellite speakers are also fairly good quality for a $200 2.1 setup, albeit a bit thin and crowded-sounding at times thanks to their small size. Stereo response is great, with good left-right play and excellent center channel simulation. Stay away from the faux-7.1 surround though: In my experience it’s pretty mediocre in both music and games/films. It gives everything a “wide” feeling, but doesn’t at all feel like a proper 5.1 surround system. I could easily tell all sounds were still coming from the front. The bigger issue remains that you’re paying a premium for the lighting. The Klipsch 2.1 setup I mentioned is the same price as the G560, and you’ll lose out on the RGB effect—but the Klipsch speakers sound better. Others, like Logitech’s Z623, sound maybe a bit worse, but not enough that you’re likely to notice, and that set costs half as much. Personally I think the RGB lighting is worth the money, but it’s definitely a needless luxury. 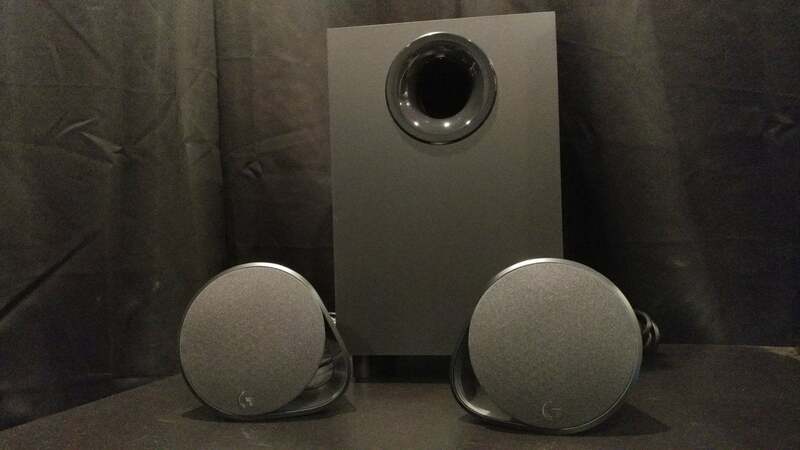 Those who just need functional speakers probably won’t want to spend this much, while audiophiles will be let down by the G560 and opt for something better. It’s a weird limbo to be in. The knock-off IllumiRoom effect is really cool though. 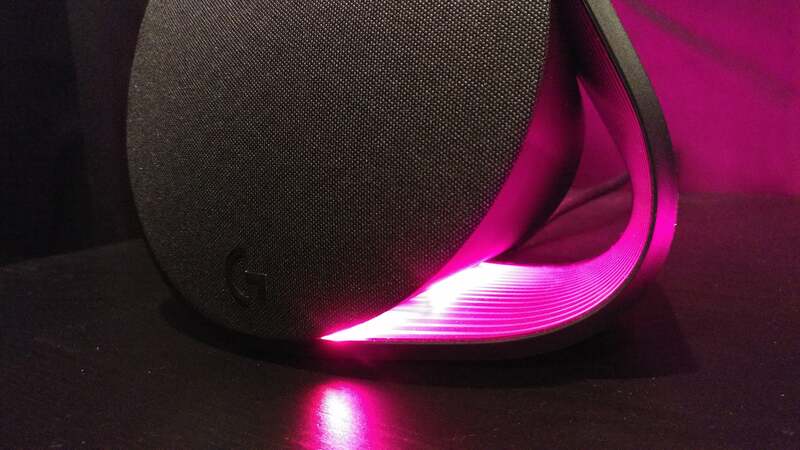 While I don’t think the G560 is a must-have speaker system, I hope it’s the first of many products with ambient RGB lighting. I continue to play a ton of Destiny 2, and it really is a great showcase for the G560, the way every planet has a different color scheme, or how so many areas have high-contrast shadowy areas with a few bright lights. I suspect Doom would also be a great demo. In any case, it’s the first RGB device I’ve used that’s enhanced my gaming experience in some way, and that’s saying a lot. I wish the tech were paired with a better set of speakers, or even a set of speakers without weird volume quirks. But hey, a smattering of annoyances haven’t stopped me from keeping them on my desk for the last six months, so Logitech clearly did something right. Logitech's G560 system could use better speakers and better software, but the RGB lighting effects are so good you might put up with the annoyances.